3. Consider the schmitt trigger circuit shown below. 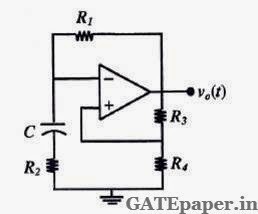 In the following transistor circuit, VBE = 0.7 volts, re = 25 mV/IE, β and all the capacitances are very large. 1. 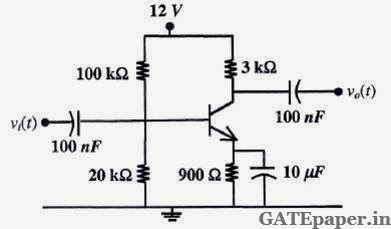 In the following Astable Multivibrator circuit, which properties of Vo(t) depend on R2 ? 2. In the circuit shown below, the OP-AMP is ideal, the transistor has VBE = 0.6 volts and β = 150. 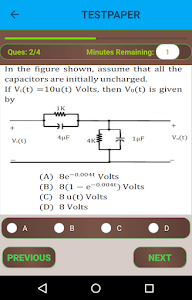 Decide whether the feedback in the circuit is positive or negative and determine the voltage V at the output of the OP-AMP. 3. A small signal source Vi(t) = Acos20t + Bsin106t is applied to a transistor amplifier as shown below. The transistor has β = 150 and hie = 3 KΩ. Which expression best approximate Vo(t). 1. The amplifier circuit shown below uses a silicon transistor. 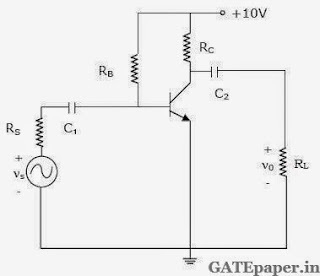 The capacitors CC and CE can be assumed to be short at signal frequency and effect of output resistance ro can be ignored. 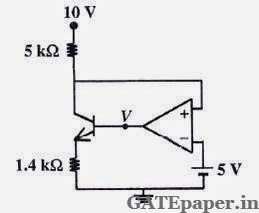 If CE is disconnected from the circuit, which one of the following statements is TRUE. 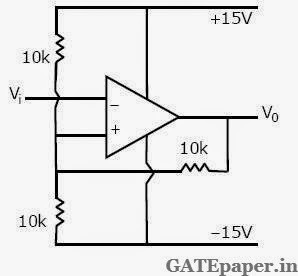 Consider the common emitter amplifier shown below with the following circuit parameters. β = 100, gm = 0.3861 A/V, ro = 259 Ω, RS = 1 KΩ, RB = 93 KΩ, RC = 250 Ω, RL = 1 KΩ, C1 = ∞ and C2 = 4.7 µF. In the circuit shown below, assume that the voltage drop across a forward biased diode is 0.7 votls. The thermal voltage VT = KT/q = 25 mV. The small signal input vi = 100 cos(ωt) mV. 1. The current ib through the base of a silicon NPN transistor is 1+0.1cos (10000πt) mA. At 300oK, the rπ in the small signal model of the transistor is ________ (in Ohms). 2. The impedance looking into nodes 1 and 2 in the given circuit is________ (in Ohms).